OK, yesterday, was bad news Thursday--and I hope you all fired off letters to the CM like I did! At the end of yesterday's post, I promised to give you one reason why I think Delhi is a World Class City. And do you know what? I'm going to give you three! How's that for a bargain? 1. Farmers. Last night as the auto I was in shot by Jantar Mantar, I saw the tail end of a huge mobilization of farmers who came to Delhi for the opening day of Parliament. They were protesting sugar cane pricing, among other things. It was a moving site. We don't see many farmers in Delhi, and sometimes it is easy to forget that there is nothing we depend on more than the millions of men and women who grow the food we eat every day. Without them, there would be no city, World Class or no! 2. Buses. Last night, I caught one of the DTC's new AC buses home from CP at rush hour. The trip took a little longer than a three wheeler would have taken, but even with the recent rate hike, it cost less than a third as much. Hey, I know there are plenty of problems with Delhi buses. (If you doubt that, just google "killer buses". I did, and 8 of the fist 10 terms that came up were talking about our fair city.) In addition to being dangerous, our buses are often over-crowded and uncomfortable, especially for women passengers. But this presentation makes it clear that we need more, not fewer buses. Bus ridership is actually declining in Delhi, but buses still carry more than 40 percent of our traffic, and they take up almost no room on the road compared to cars and two wheelers. Imagine what the roads would be without them. Buses are part of what make Delhi a great city; more buses will make us even better. 3. Bookaroo. I've written at length about the weaknesses in our schools and argued that one of our problems is that our children are not asked to read enough. Reading is part of how children learn how to think, and today's children will need to do some very creative thinking to solve the problems we are leaving them. 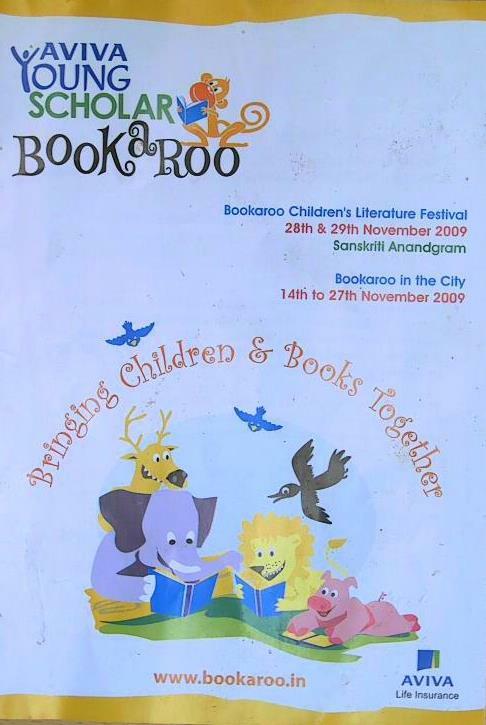 Well, if you agree with that, and if you have a child, you really should not miss Delhi's one and only Children's Literary Festival, Bookaroo, November 28-29 at Sanskriti Anand Gram. Like many things in Delhi, it's completely free. Last year's festival was absolutely fantastic; I'm sure it will be this year, as well. There are amazing authors coming, like Subhadra Sen Gupta, who we reviewed briefly at the end of this post. Others include Anushka Ravi Shankar (Moin and the Monster), Andrew Cope (Spy Dog) and Sampurna Chatterji (The Fried Frog and Other Funny, Freaky, Feisty Poems). Don't miss it. Most of the sessions do not require registration; just show up. There are a few that do require registration; you can do that via email. I was going to list a few "green picks." But the two sessions I was going to recommend are two of the only ones where registration is already closed. Too bad, but there is still great stuff going on. For more information, go here. So there you have it folks: farmers, buses, and Bookaroo! Three things that make Delhi a World Class City! Very interesting article.. keep posting..